Why Purchase Your Watches From Zadok Jewelers? Indeed. What does make a great watch? Well, a lot goes into one. Literally. Take for instance the illustration above of a Jaeger-LeCoultre Calibre 182. It’s a technical drawing in cross-section that shows how it’s 1,300 parts combine to form a mechanism whose height barely exceeds 1 centimeter. That’s astounding engineering, precision, beauty and detail. So yes, a lot goes into a fine timepiece. Fine watches and timepieces are indeed much more than just the sum of their individual parts. We’ve created this page of our website to help you understand better and know more about fine watches so that you may make a better, more informed decision when purchasing. Band – The strap, band, or bracelet that holds your watch to your wrist. Watches are typically sized to fit wrists from 8 to 10 inches. Most watches are easy to size to fit. If you have a leather band, simply cinch the band to fit the buckle hole that is most comfortable for your wrist. If you have a stainless steel bracelet band and you need additional links, contact the watch manufacturer directly using the phone number or e-mail address listed on your watch brand page. Band Length – This is the length of the watch from tip to tip. On a watch with a stainless steel bracelet band, this measurement is the circumference of the inside of the band, or the area that would fit around the wrist. This measurement on most watches with metal bracelets is roughly 10 inches, and is designed to be shortened. When you buy this type of watch look to the owner’s guide for instruction on how to remove links so that your watch will fit properly. Bezel – The area outside the face, which secures the crystal to the watch. Many watches have a uni- or multi-directional bezel that can twist one or both ways around the watch face. This type of bezel can be used to twist around to the minute hand to measure elapsed time. 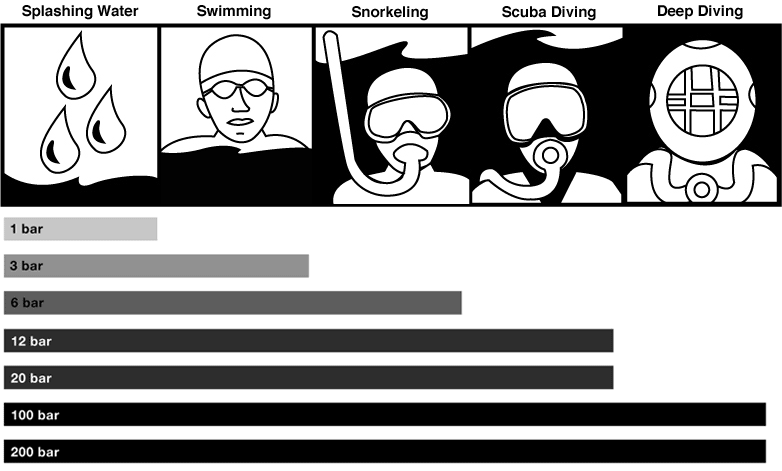 For divers who need to measure elapsed time underwater, a unidirectional bezel is useful because it is less likely to be accidentally hit and moved. Bracelet Band – Any watchband made up of metal links. There are many different bracelet band styles, including bangle, solid, mesh, and more. Case Length – In inches, the approximate measurement of the case from one edge of the band to the other band edge. Case Thickness – In inches, the approximate measurement of the case depth measured from the back to the front along the side of the watch. Case Width – In inches, the approximate measurement from the tip of the crown horizontally across the watch to the other side. Clasp – The latching mechanism that closes to secure the watch band to your wrist. View the different types of watch clasps: Buckle, Deployment buckle, Bracelet clasp, Folding clasp, Hook buckle, Hidden watch clasp, Push-button hidden clasp. Date Window – A window on the watch face that displays the day of the month, and sometimes the day of the week as well. Markers – Visual marks on the watch that indicate minutes or hours. Many times these are illuminated, making it easier to tell the time in dim light. Second Hand – This is the thinnest hand anchored in the center of the watch face. On quartz watches, this hand moves every second. On an automatic watch, this hand moves smoothly, sweeping by each second marker in second increments. Tachymeter – A function of a watch chronograph similar to a stop watch feature that can measure the rate of speed traveled over a measured distance in a particular length of time. This is usually used to measure high rates of speed. For example, the user can start a timer, drive or fly a mile, and then stop the timer and the timer hand will point to the MPH traveled. 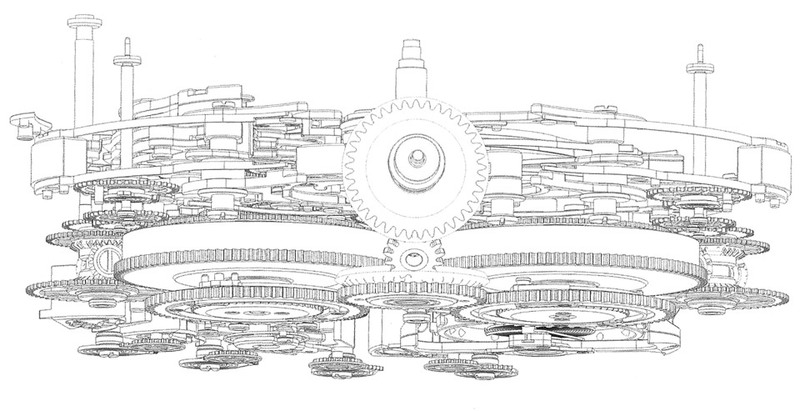 As you can see in the technical rendering below of the internals of a Jaeger-LeCoultre timepiece, fine timepieces are incredibly complex instruments. They are incredibly designed and engineered to last for many years, even decades and maintain their precision time keeping capabilities. Automatic Movement – A type of watch movement that uses energy created by the action of the wearer’s arm. Arm movement makes a weight (rotor) oscillate and triggers the mainspring to wind the watch. No battery is needed. Many automatic watches will tell time for up to 36-hours off the wrist, after which time the watch will stop working and must be either wound by hand or rocked for a minute or two to begin keeping time again. Automatic movement is typically found only in fine watches. Battery – Quartz watches use a battery that is powered using silver oxide, which provides 1.5 volts of energy for anywhere from 1 to 5 years. Lithium batteries can last as long as 10 years, and deliver 3 volts of energy. Always make sure that your replacement battery is the same type as the original. Battery Life – The duration that the battery will continue to provide power. Typically, this period begins when the battery is installed at the watch factory, so the watch battery could run down sooner than the expected battery life. If this happens, follow your manufacturer’s instructions. Note: Automatic watches or watches that are powered by light or movement will never need a battery change. Chronograph – A watch with timing functions that are displayed in subdials on the face of the watch. Most chronographs are comprised of three subdials, and can measure fractions of seconds, minutes in increments other than 60, and hours in other than one-hour increments. Chronographs should not be confused with chronometers, which are devices with accuracy so exact that they have met special time standards set by the Swiss Official Chronometer Testing Institute (C.O.S.C.). Chronometer – A less common and more expensive form of timepiece. A chronometer achieves accuracy so exact that it has met special time standards set by the Swiss Official Chronometer Testing Institute (C.O.S.C.). Complication – This defines any function besides hours, minutes and seconds. A Grand Complication is a timepiece with at least three complications from groups of specific functions: usually a chronograph, perpetual calendar (which usually includes a moon phase indicator) and a minute repeater or alarm. Crystal – The protective clear cover that fits over the watch dial. It can be made of mineral, synthetic sapphire, plastic, or acrylic material. The sapphire crystal is the most durable, as only a diamond can scratch its surface. Flyback Chronograph – A chronograph designed to facilitate quick resets. One push of the button starts the seconds hand. The second push resets the second hand to zero and begins timing again. For most chronographs, you push once to start, again to stop, and use another button to reset to zero. Tourbillon – Invented in 1801 to regulate deviations in timekeeping in pocket watches due to the effects of gravity. There is no more coveted (or expensive) work of horology (the art or science of measuring time) and none more difficult to execute. The convention is to open a window on the dial to expose the beautiful escapement mechanism – consisting of the hairspring and pivoting balance wheel mounted inside a rotating carriage. Perpetual Calendar – This is a watch with the day/date/year indicators and is called perpetual because it automatically adjusts to months with 30 days and to the 28 or 29 days in February. Unless it takes into account century years that are not leap years, it will need adjusting in 2100, 2200 and 2300 (because of a glitch in the Gregorian calendar), so when you bequeath the watch to your heirs be sure to leave instructions. This is the ability of a watch to resist penetration by water. On most watches, you can find the water resistance level on the back of the watch case listed in ATM (atmostpheres), Meters or Bar. One ATM is equivalent to 33 feet. Most watches are water resistant, meaning that they resist but are not impenetrable by water when washing your hands. Some watches are resistant to higher pressures experienced at underwater depths. Meters, used by some companies to indicate water-resistance cannot be equated with the dive depth of a dive because of the test procedures that are frequently used. Meters also do not permit any conclusions to be drawn about the actual uses in the presence of moisture or wetness in aor under the water. Water resistant watches are usually tested for water-resistance on the basis of international standard ISO 2281 and diver’s watches (watches that are water-resistant to at least 10 bar) on the basis of international standard ISO 6425. Please remember that even though a watch case may be water-resistant to an adequate depth, the watch strap may not be suitable for use underwater because of the materials used in its construction. Also bear in mind that, with the exception of divers watches, the external moving parts of a watch (crown, buttons, etc.) should not be operated under water. Before wearing the timepiece in or under water you should make sure that all of it’s external moving parts are in their rest position. It’s also wise to note that water-resistance is not a permanent thing and that parts and seals cand and do wear out with aging and wear. These should be inspected periodically by an authorized service center for possible replace. You should refer to the manual that came with your timepiece for most specific instructions. Remember, no watch is water proof. Any watch can be penetrated by water under the right circumstances. For instance, it’s incredibly tough, if not impossible for just about anything man-made to withstand the extreme crushing pressure at the deeper depths of the ocean. If you’d like, you can read more about water-resistance at this Wikipedia article on the subject.